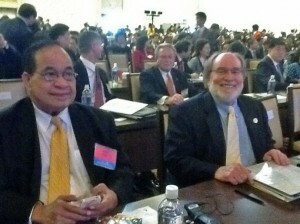 Governor Abercrombie seated next to Benigno Repeki Fitial, governor of the Commonwealth of the Northern Mariana Islands. Courtesy of Gov. Abercrombie. 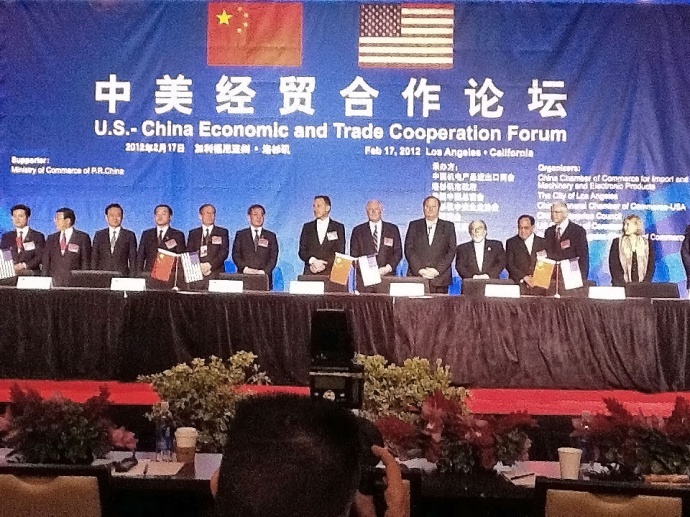 On Friday, Governor Neil Abercrombie attended the U.S.-China Economic Trade and Trade Cooperation Forum & Signing Ceremony. The events in California concluded Chinese Vice President Xi Jinping’s visit to the United States. 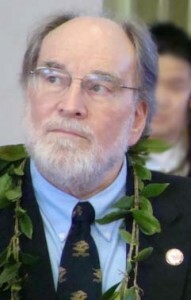 Governor Abercrombie attended the event at the invitation of Vice President Joe Biden and California Governor Jerry Brown. 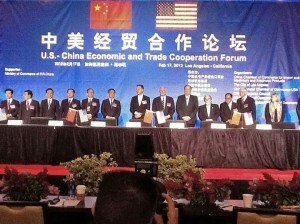 The aim of the Forum was to encourage more Chinese investment in the United States. 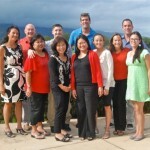 “It is important for us to continue to build on the momentum of the relationships that we’ve established with China. 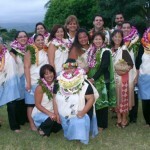 I intend to make the most of my short time here in hopes of expanding business and visitor industry relationships for Hawai’I,” said Governor Abercrombie, in a written statement. Governor Abercrombie on stage during signing ceremony. Courtesy of Gov. Abercrombie. Accompanying Governor Abercrombie was the Department of Business and Economic Development and Tourism Director Richard Lim and Hawai’i Tourism Authority President Mike McCartney. 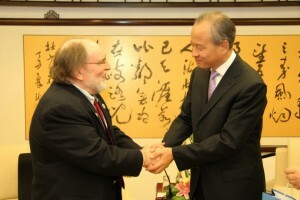 Following the day-long Forum, Governor Abercrombie attended a US-China Governors’ Roundtable, followed by an official dinner hosted by Chinese dignitaries. 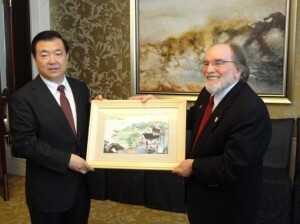 In October 2011, Governor Abercrombie visited Beijing during a National Governors Association China Forum. A month later, at the conclusion of the Asia Pacific Economic Cooperation Hawai’i China CEO Forum, the Governor signed an agreement with Mr. Yu Ping, Vice Chairman of the China Council for Promotion, to pursue mutual interests in clean energy development.